A cat was referred to DoveLewis with respiratory distress after trauma. Coby Richter, DVM, DACVS, discusses the eventual surgical exploration that revealed a rare double hernia. A 10.5 –year–old neutered male domestic longhair cat presented to the referring veterinarian shortly after witnessed vehicular trauma. On presentation he was in severe respiratory distress with harsh lung sounds and open- mouthed breathing. Oxygen and intravenous fluid therapy were started, buprenorphine administered for pain control, and two–view thoracic radiographs taken. Radiologist interpretation included pulmonary contusions, possible abdominal effusion and a concern for diaphragmatic hernia. A FAST did not show evidence of urinary bladder rupture. Initial bloodwork revealed a moderate anemia of PCV 24% and total solids of 5.5 g/dl, elevated ALT (652 mg/dl), mild hyperglycemia (210) and normal electrolytes, alkaline phosphatase, BUN, creatinine and platelets. The cat was administered a dose of furosemide because of the concern for fluid overload in the face of pulmonary contusions and hydromorphone for added pain relief. He was referred to DoveLewis for further stabilization, diagnostics and treatment. His history was unremarkable for any other disease or trauma and he was current on all vaccinations. Upon presentation to DoveLewis the cat was open–mouthed breathing with a heart rate of 210 bpm and a temperature of 101.1° F. He was mildly sedate and able to stand with assistance. No abnormalities were found on abdominal palpation beyond a distended urinary bladder, nor were any fractures or luxations appreciated. Thoracic auscultation revealed increased bronchovesicular sounds ventrally and decreased sounds dorsally. A blood pressure was not taken upon admit due to the degree of respiratory distress. The cat was placed immediately into oxygen (40%) and restarted on IV lactated ringers solution at 7 ml/hour (1.5 ml/kg/hr). A fentanyl continuous rate infusion was begun at 3 μg/kg/hour. SPO2 in the oxygen cage was 96%. A II/VI cardiac murmur was ausculted. 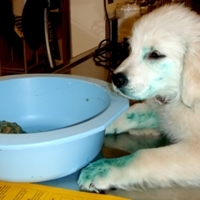 The owner consented to continued intensive monitoring and support, recheck thoracic radiographs, blood transfusion if necessary and possible abdominal ultrasound when he was more stable. Radiographs taken two hours after arrival under mild sedation showed pulmonary contusions, a small cardiac silhouette, mild pneumothorax, pleural effusion and severe aerophagia. No definitive evidence of a diaphragmatic hernia was seen. The cat's respiratory rate decreased to 30/minute and SPO2 improved to 100% on oxygen following the radiographic procedure. Blood collected at this time showed PCV 28% and total solids of 6.2 g/dl. The day following trauma, the cat remained tachypnic and would open–mouth breathe when handled. Bilateral thoracocentesis under mild sedation was negative for free air. Pain management was reassessed and fentanyl increased to 5 μg/kg/hr, which resulted in improved respiratory rate and effort. A concern for diaphragmatic trauma suspected on initial films at the referring veterinary facility,(but not on follow–up films) continued due to clinical distress, which returned after any handling. However, surgery was not considered an appropriate choice for this patient until he became a better anesthetic candidate. Forty hours after admit, the cat was induced with propfol and intubated to allow sonographic examination while maintaining good oxygenation. A nasogastric tube was passed to relieve aerophagia (to improve image quality). The exam revealed a ventral diaphragmatic hernia with some liver identified in the thorax, a small quantity of bicavitary effusion, and a regionally polycystic liver. The owners were consulted and agreed to proceed to surgery for repair. Surgical exploration revealed a 3 cm right–sided acute vertically oriented rent in the dorsal aspect of the diaphragm (TDH = traumatic diaphragmatic hernia), as well as a 2 cm chronic peritoneo–pericardial diaphragmatic hernia (PPDH). Liver was visualized within the pericardial sac, but no other abdominal organs were within the thorax at the time of surgery. The left medial liver lobe was not found within the abdomen and it was surmised that this was the lobe residing within the hernial sac. The right medial lobe and gall bladder were covered with a mature blood clot, but were otherwise unremarkable. The remainder of the exploration was within normal limits. The PPDH was enlarged ventrally to allow gentle manipulation of the liver lobe back within the abdomen. Several fibrous adhesions between the herniated liver lobe and the pericardial sac were sharply dissected. The liver lobe was normal in color and density, but had assumed a convex wedge shape (similar to an orange slice) that fit around the apex of the heart. A subtotal pericardectomy and resection of the hernial sac were performed. 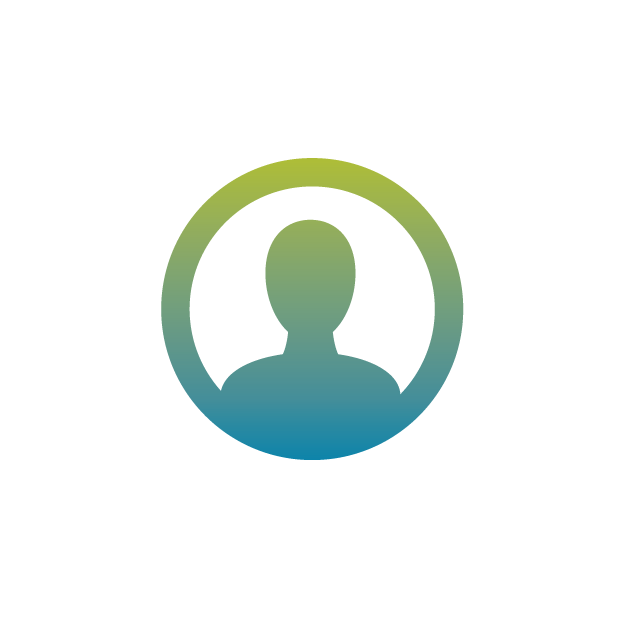 The acute TDH and PPDH were debrided to create a single diaphragmatic defect. The hernia was closed with a series of cruciate sutures after lavage of both abdomen and thoracic cavities. The caudal lung fields appeared normal and were inflating as expected during repair. A 7 mm round Jackson Pratt drain was placed percutaneously lateral to the abdominal incision and through the diaphragm dorsally on the right side to allow fenestrations to be present on either side of the diaphragm. Fluid and air were suctioned from both cavities as abdominal closure was achieved. The cat did well throughout anesthesia (IPPV kept below 15 cm H20, negative pleural pressure not attempted during surgery) and recovered smoothly in 40% oxygen. Oxygen support was weaned over the next 10 hours but reinstituted when the cat demonstrated an acute episode of respiratory distress and open–mouthed breathing. The JP drain produced serosanguinous fluid at 2–2.5 ml/kg/hour for the first 12 hours after surgery then decreased to 0.5 to 1.5 ml/kg/hour for the next 24 hours and was removed 36 hours after surgery. An 8F chest tube was placed approximately 12 hours after surgery during the episode of respiratory distress. Radiographs at this time showed a pneumothorax with appropriate placement of both JP drain and chest tube. The chest tube was aspirated at two hour intervals with intermittent air recovery. His respiratory distress improved steadily over the following 24 hours and the chest tube was removed 58 hours after placement. The day following chest tube removal, the cat exhibited normal respiratory rate and effort, began to eat canned food when hand fed and was comfortable on abdominal palpation. He was discharged on buprenorphine and amoxicillin–clavulanic acid with exercise restriction for four weeks. Recheck bloodwork at the referring veterinarian five days post surgery showed a mild anemia and stress leukogram with normal liver values. Two weeks following surgery, he was eating well with no evidence of respiratory distress or abdominal discomfort. In cats, TDH most often results from vehicular or other blunt abdominal trauma. Reported mortality rates with acute hernias, range from 16–20% with younger animals having a greater chance of survival. Concurrent injuries such as fractures or other hernias (body wall or inguinal) are associated with higher mortality rates. The most common clinical signs of TDH in cats are tachypnea (RR >40 bpm), dyspnea, muffled heart sounds and vomiting. Anemia and hypoproteinemia are reported in 21% and 28% of acute cases respectively. Electrolyte and blood chemistry abnormalities, while important for patient management, are not very useful in diagnosis or prognostication due to wide variation in cats with TDH. Left–sided and right–sided rents are approximately equal (44% vs. 38%) in incidence and ventral hernias make up about 14% of the cases reported. The liver is the most commonly herniated organ (82%) with stomach, small intestine, omentum, spleen, large intestine, gall bladder and pancreas reported with decreasing frequency. Definitive diagnosis of diaphragmatic hernias is generally accomplished via radiography or ultrasonography. Challenges to radiographic diagnosis include viscera that is only intermittently within the thorax, pulmonary contusions and hemothorax that may obscure herniated organs, or if a small portion of liver is herniated it can be difficult to discriminate from normal thoracic structures. Ultrasonography can be helpful in those cases with effusion or transient herniation. Positive contrast celiography and computed tomography can also be of use when herniation is not obvious on plain radiographs. Timing of surgical repair is an important aspect of case management in both PPDH and TDH. 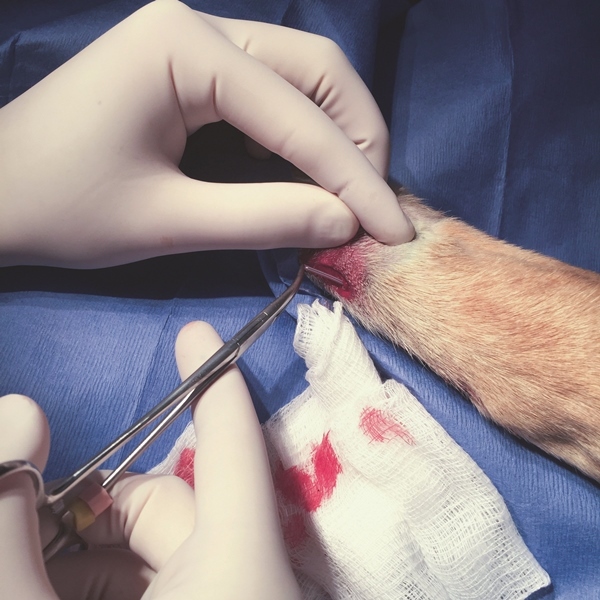 Some retrospective studies have demonstrated increased mortality, particularly in dogs, when patients were taken to surgery less than 12 hours after injury. It is believed that increased risk of death was due to Multiple Organ Dysfunction Syndrome (MODS) and shock exacerbated by anesthesia and surgery. Stabilizing the patient is essential; however, there are at least three indications for immediate surgery in spite of an unstable patient: a) gastric herniation with tympany, b) suspected continued hemorrhage and hypovolemia despite fluid resuscitation and c) interminable abdominal pain associated with bowel strangulation. Anesthesia of diaphragmatic hernia patients requires an emphasis on ensuring IPPV pressures do not exceed a pressure of 15 cm H20 and that pneumothorax is not resolved abruptly during surgery, particularly in chronic cases. Surgical guidelines suggest gradually alleviating pneumothorax over 8–12 hours post procedure. In this case, oxygen, fluid therapy and pain management allowed some resolution of the acute pulmonary trauma to recede prior to surgical herniorrhaphy. Major complications following surgical repair include re–expansion pulmonary edema, pneumothorax, hydrothorax, hemothorax, re–herniation, gastric torsion, shock, hemorrhage and cardiac arrhythmias. Tachypnea and dyspnea are common minor complications following TDH, both seen in the case described above, and may be attributed to pain, stress, acidosis, residual pneumothorax, rib fractures or primary lung disease. PPDH in cats is the result of a congenital communication between the pericardial sac and the peritoneal cavity with a reported prevalence of 0.25%. It is one of the most common congenital cardiac defects diagnosed in cats over two years of age. Surgical correction vs. medical management is based on the clinical picture with cats showing overt clinical signs being good candidates for herniorrhaphy. In a recent retrospective of 66 cases, PPDH was an incidental finding in 27 cats, further supporting serious consideration of medical management in some cases. The cat in this report did not have any previous history of exercise intolerance or dyspnea to suggest the PPDH was limiting his quality of life. The acute TDH occurred parallel to the PPDH ring rather than through the ring of the existing defect. It is suspected that the chronicity of the PPDH made the fibrous ring located within the central tendon the strongest region of the diaphragm, allowing abrupt forces to tear the pars costalis muscle instead. Prognosis for cats following surgical herniorrhaphy (whether PPDH or TDH) is generally excellent for those animals surviving the initial two day post–operative period. What’s your favorite ‘surprise’ found in a patient during surgery? 1. Traumatic diaphragmatic hernia in cats: 34 cases (1991–2001) Schmiedt et al. JAVMA, vol 222, No. 9, 2003. 2. Long–term outcome of cats treated conservatively or surgically for peritoneopericardial diaphragmatic hernia: 66 cases (1987–2002) Reimer et al. JAVMA, vol 224, No. 5, 2004. 3. Perioperative survival rates after surgery for diaphragmatic hernia in dogs and cats: 92 cases (1990–2002). Gibson et al. JAVMA, vol 227, No. 1, 2005. 4. 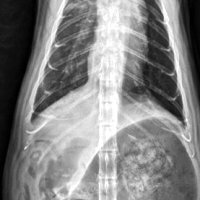 Chronic diaphragmatic hernia in 34 dogs and 16 cats Minihan et al. JAAHA vol 40, 2004. Before we began a routine spay, I asked the doctor if he had ever seen a one horned uterus in all his forty two years as a DVM. He said only a few reproductive surprises, mostly testicular. Then the most ironic thing takes place during surgery. Our current canine spay turns out to only have one uterine horn. It was a little "Twilight Zone" episode, but interesting just the same. Really enjoyed your article (as well, I very much enjoy my clinic's subscription with @Dove!). I would love to know how this patient did vis a vis his capnographic profile throughout surgery. Did you measure PaCo2 by any chance? And, by the way, I do enjoy @Dove's various articles and videos on Capnography (and everything else)! "Thanks for your questions! I pulled his anesthetic record (from 2010) which was several years before we transitioned to entirely digital anesthesia record. We do have ET CO2 points but we did not pull an art gas on this patient during surgery. It certainly would have been nice to see what his arterial gases were doing during anesthesia and in recovery. Post operatively, his SpO2 was steadily improving which was likely a factor in not sampling his arterial side. - Coby"
If I or Dr. Richter can answer any further questions, please let me know.